» All that winter rain — could we sell it? All that winter rain — could we sell it? 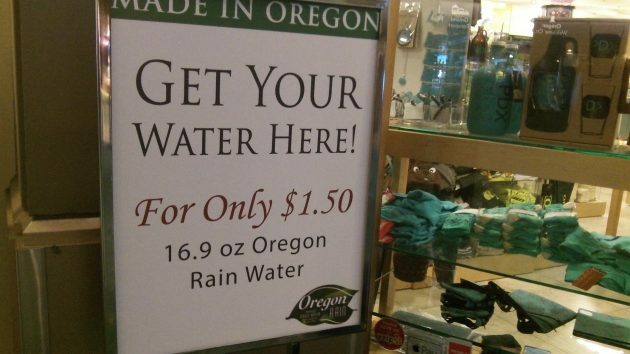 Oregon rain for sale at the Portland Airport: How about scaling that up? Once again this fall, as usual, we have rain, lots and lots of rain. The Willamette River is running full without doing anybody any good. All around us we have water, way too much water. So when I came across this shot of a sign outside the Oregon store at PDX, taken in September, I had an idea. Why not sell our surplus water to somebody who doesn’t have enough? Farmers in the Central Valley of California, for example. Gov. Kate Brown is trying to figure out how to pay for the state government’s always increasing costs. At this point it looks as though state revenues, even through rising, will be more than $1 billion short of what the agencies want for the next two budget years. In California, on the other hand, there’s been news of a budget surplus. So perhaps it’s time for Kate and Jerry Brown to get together and talk about a deal, a water deal. Oregon owns the “waters of the state.” Try building a pond on your property without getting permission and you’ll be reminded of that. So if western Oregon has more water than anybody needs, what would be wrong with turning the surplus to the state’s advantage? In the San Joaquin Valley, still suffering from a long drought, farmers blame state and federal politicians for making their water shortage worse or not doing enough to solve it. So here’s an opportunity for Sacramento to do something for this important segment of its state economy. The Assembly could budget a couple billion dollars to buy Oregon water and make it available to their parched orchards and fields. The Oregon water could be loaded on long trains of tank cars, and the Union Pacific could take it south. It might not make up for California’s drought, but it would keep at least part of its farm economy going for another year. Some of us old-timers remember back in the 60’s when this very idea was “floated”. One suggestion was to run the pipeline down the coast where there would be less difficult construction – maybe even on the ocean floor. Plus, if the thing sprung a leak the water would go into the ocean where it was first headed anyway. The idea was dropped due to rain in California, I believe. In any case, the idea is DOA because environmentalists would tie it up in court forever (or at least our lifetime). Interesting concept though – actually using our natural resources. This has been proposed so many times for 50 years. The economics don’t pan out so to date. One of the more interesting is a pipelline that just off shore, using the centripetal force of the Earth to move water from the mouth of a river (such as the Columbia) to California. The amount of money to make this happen is staggering, and California customers would not pay the cost of what that water would cost — estimates put it at 10x and more. Simply google ‘pipeline water to California’ and you’ll see lots of proposals that will not currently work due to cost. BTW, during the drought a few years back I have a California friend who was complaining about his water costs. I had him get out his water bill and find the rate. Even with the raised rate — the one he complained about — his rate per unit (either they were the same as Albany, or we did the conversion) was far less than what Albany residents pay for their water. If you were to ask many Californians to pay Albany water rates, they would be up in arms! They have very cheap water down there. Buy the time an environmental impact study was done, then a route proposed, surveyed, argued about, acquired and constructed at jillions of dollars in over runs, we probably wouldn’t have any water to send south. Rather than selling Oregon’s precious (and admittedly overabundant at present) water to parts unknown, it makes more sense for states with drought issues to harvest ocean water and run it through anti-saline purification factories. Granted that won’t profit Oregon monetarily but it will save our environment. It seems like a monumental task but it may be better than continuing to pump the groundwater into non-existence or all of them moving up here.